Pope John Paul II canonized St. Maria Faustina in 2000 and instituted the Feast of the Divine Mercy to be observed on the first Sunday after Easter. It is no coincidence that John Paul the Great’s beautification celebration falls on the Divine Mercy Sunday, May 1st, 2011. 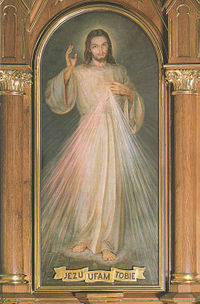 Go “live” at 3:00 pm EST every day from April 22 to April 30, and pray the Divine Mercy Novena with Cathy and Denis at Marytv.tv. We believe it will bring about a part of Our Lady’s plan. Learn more at www.marytv.tv!